Zhongke understands that your reputation relies on the product you create, and being able to consistently meet your customer's expectations to build trust and long term partnerships. With this in mind and after conducting extensive research, Zhongke has invested heavily in developing the most technologically advanced, intelligent optical sorter available for rice today. Designed and built in the China, RC+ is a revolution in rice sorting, delivering the highest capacity and export quality standards with ease and pinpoint accuracy. Never before has so much precision, flexibility and simplicity been available, with such control over each individual defect. Available with up to six chutes and a patented feed system to deliver an even higher capacity per chute. Control over every defect, allowing users to adjust the amount of each defect removed with the slide of a button. Scientifically designed to improve illumination and enhance defect recognition in rice. A unique and proprietary designed camera specifically for rice. Provides the ultimate in the detection of all known defects and foreign material. Improves the accuracy of the ejection of rejects, even during very high capacity processing. Power and control from one screen, beautifully displayed on a 15 inch touch-panel. 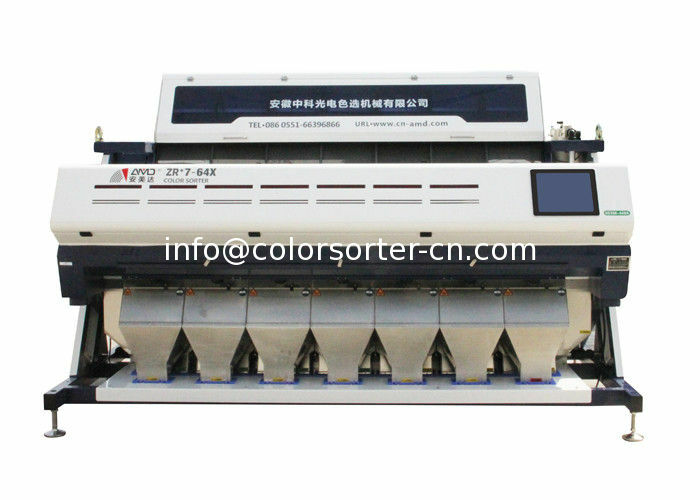 Pre-installed on the optical sorter to provide export quality sorting at the touch of a button. The optical sorter consistently scans and automatically adjusts to the incoming product, removing the need for laborious manual setup. Remote access enables Zhongke engineers to support RC+, including sorting performance adjustment from anywhere in the world. Can be cleaned without the need to remove chutes or receptacles, helping to keep sorting performance consistently running at its peak. Open construction and new design to make cleaning and hygiene simple. Discolored grains, defects, plastics, glass, stones, paddy and foreign seeds can all dent profits. Zhongke RC+ can detect and remove these better than ever before. A combination of an all-new inspection system, comprising of Multi-Chromatic cameras, Crosshair Targeting technology and Textured LED Lighting can detect the most subtle discoloration and defects – including varying degrees of purples, greys, yellows, streaks, pecks, black tips, spots, chalky and immature or rotten grains. The result is premium quality rice that satisfies the most stringent international food quality and safety standards whilst matching exact customer accept requirements with ease. The optical sorting solution delivers high efficiency in the removal of visual defects such as discolored, yellow, grey, purple, peck, chalky, bran streaks, immature, and others. This efficiency greatly enhances the product appearance.